The recent oil spill degrading water quality and harming wildlife along the Savannah River is an unfortunate but enlightening example at a time when offshore oil and gas development is being unwisely supported by our state officials. As suggested by this relatively small oil spill, risks of larger industrial accidents or natural events, either offshore or shoreside, could bring catastrophic worst-case scenarios. These would include sustained damage to estuaries, with corresponding loss of fisheries – both commercial and recreational – that depend on the prolific nutrients of these inter-tidal areas. Coastal tourism business would also plummet. In spite of such risks, Georgia Senators Isakson and Chambliss have consistently voted to lift the 25-year ban against offshore drilling, and Congressman Kingston recently chimed in harmony with them. Likewise, Georgia’s draft State Energy Plan includes a statement supporting development of fossil fuels offshore. Such positions seem willfully ignorant in light of major issues that the officials of neighboring states clearly acknowledge. Congressional representatives and senators of both parties from Florida, North Carolina, and South Carolina have voiced strong opposition to offshore oil and gas development, citing the risks to coastal economic and environmental interests that far outweigh any benefits. Despite the results of past exploration off Georgia’s shore in the late 1970s, when geologists found little reason to believe recoverable reserves were available, both the price of fuel and advancements in technology may seem to be cause for reconsideration. However, numerous reports conclude that even the most optimistic estimates of offshore reserves nationally would fall far short of rapidly expanding demand. By the time any of these new fossil fuel reserves were made available to consumers, we would be even more dependent on foreign sources than we are now. 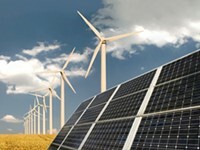 Furthermore, during the extended period of disruptive exploration, drilling, production, and delivery to the market, alternatively, new and cleaner energy technologies could be put online that would far out-produce conventional sources, provided that investors were given comparable subsidies and tax benefits. As just one example, in a single year using existing technologies, enough wind-powered energy-generators could be installed to produce more electricity than the average U.S. nuclear power plant. Fiber-based ethanol is also a highly promising alternative to gasoline, with tremendous economic prospects for the ag and timber industries of Georgia. Instead of advancing these promising new alternatives, our leadership is taking us in the direction of obsolete technologies with still more risks to the environment and public health. Moreover, generating electricity using fossil fuel resources requires large amounts of water for processing and cooling, which would further compound Georgia’s water management problems, both within the state and beyond. As we face the widely predicted prospect of major coastal storms of greater intensity and frequency, any development of such facilities on our coast would cause greater hazards from such events. By locating major energy facilities for fossil fuel extraction, processing and storage in harm’s way, hurricane storm surges and winds would likely inflict even more destruction – with threatening implications for our region’s communities, water quality, nature-based businesses, and essential habitat of fish, birds, and other wildlife. It is time for coastal Georgians to speak out on these critical energy issues. If conventional thinking is allowed to prevail, promising new energy technologies will fall far short of their potential. David A. Kyler is executive director of the Center for a Sustainable Coast, based in St. Simons Island, Ga.